It's not everyday that you get to see a rainbow appear in the sky, but when you do, it's one of the most beautiful and enchanting experiences that nature gifts USA. 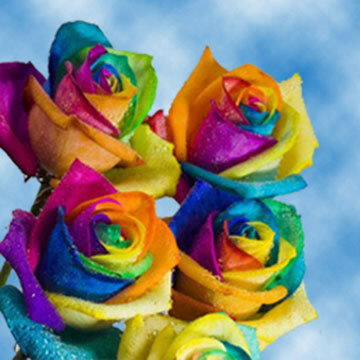 Since we know just how uplifting that rare experience can be, we have captured the beauty of a rainbow within the petals of our Tie-Dye Roses through our special dying technique, because we believe it should be shared anytime, any day of the week. Exclusively brilliant colors bestow upon each petal, each petal twists, turns, and fuses with the next to create a series of radiant polychromatic spirals. Flourishing from the petals of these blossoms is a fun and exhilarating spirit that intoxicates the eye and invigorates the mind. These truly sensational florets are the perfect touch of inspiration for absolutely any occasion. They are exemplary for adding illuminating flair to a sweet sixteen birthday party, or an unforgettable way of adding cheer to a loved one's day. Get a bouquet for that special someone on your anniversary to remind them how just how much brighter they make your life. Since these buds are filled with blasts of color, they're ideal for any celebratory occasion; graduations, baby showers, birthday parties, holiday parties, weddings-you name it! We grow our Tie-Dye Roses all year round in the warmth of the South American sun, so you can relish in their beauty whenever you please. At GlobalRose.Com, we pride ourselves in our reputation of providing the freshest products possible, which is why we cut your blossoms especially for you, your loved one, or special event just days before they are delivered to your door. All of our products take just 3-4 days to deliver, so please place your order accordingly. Also, please note that color tones may vary due to monitor screen, or Mother Nature.